LIVE FROM THE DEPORTATION OFFICE: I started writing this review of Basmati Brown while I was waiting at Citizenship and Immigration Canada's Enforcement Office on the seventh floor of 300 West Georgia. For those of you who know that building as the office tower adjoining the Vancouver Public Library, you may be interested to learn that this office is where refugee claimants must regularly report, and where people are notified that they will be deported from Canada. The euphemistic doublespeak of "removal orders," "exclusion orders," and "deportation orders" regularly dealt out to visitors to this office does nothing to disguise that this is bureaucratic violence directed mainly at people of colour from Asia, Africa, Latin America, and even the occasional European visa-overstayer. Hearing these words, a Latin American man also waiting in the office turned to us, his knowing look recognizing the hypocrisy of an immigration system that depends on, yet devalues and dehumanizes working class people of colour. As I waited in the office, I overheard immigration officers talking with people facing deportation, and I would summarize what went down as follows: the system might work if you have money to try various avenues and pay hefty fees, and if not, too bad. Phinder Dulai's poems honour the value of everyday labour, the importance of those who might not be able to afford lawyers. With the book's first poem boldly announcing, "down the line/ caste(ing) and classing/ farmers and bricklayers welcome," the reader encounters a space where Brown bodies name the complexities that come with migration. Poems like "canadian, eh! or depends on who you ask!" make visible the difference in treatment received by immigrants racialized as White and as Brown, a difference I felt very keenly as I sat with Mexicans, Chinese and Africans in the waiting room, observing the blonde receptionist behind the glass window. funny how he doesn't wear a turban, i thought they all did? hey how come you don't wear a turban? life. . . matter. . . In his introduction, Dulai notes that "more than two-thirds of this collection was conceived while [he] was away from Canada, on trips through India." His poetic journeys show neither the superficiality of tourism nor the romanticism of the return to the "homeland." Instead, Dulai occupies the territories of conscience, bringing the "international" home to Canada, and in so doing, makes an important contribution to the growing body of Asian North American literature. The material legacy of America's imperial past is borne out in the ‘return’ of immigrants to the imperial centre, and whereas the past is never available to us whole and transparent, it may often be read in the narratives, cultural practices, and locations of various immigrant formations, these fragmentary, displaced memories of America's imperialism, refigured as alternative modes in which immigrants are the survivors of empire, its witnesses, the inhabitants of its borders. ("The International in the National," 29-30). The ways in which Canadian colonization is complicit with U.S. and British imperialism does not escape Dulai's attentive poetic eye. Peopled with the survivors of empire, Dulai's poems hold Canada accountable for its systemic oppression of First Nations people and "Third World-looking people" (to borrow an Australian term). Yet the beauty of Dulai's book is that it does not allow bitterness and cynicism to have the final word. In the face of a barrage of injustices, Dulai somehow asserts an indomitable spirit as well as a humble courage, which heartens this reader. POSTSCRIPT: My friend Agnes and I had entered the office at 9 a.m. We stayed the entire day, waiting until almost 4 p.m., witnessing the busy flow of refugee claimants and visa overstayers coming and going all day. Despite all our efforts and discussions with lawyers, the young Chinese woman we waited for was not released by the immigration authorities. Instead, she was detained, and told she would have to wait for a detention hearing two days later. She would have appreciated Dulai's words had we been allowed to translate them into Chinese and share them with her. Lowe, Lisa. "The International in the National." Cultural Critique 40 (1998): 29-47. Rita Wong's first book of poetry, Monkeypuzzle, was published by Press Gang Publishers in 1998. 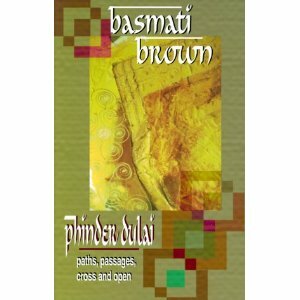 This article appears in the RicePaper 8.1 Technology issue under the title BASMATI BROWN.